Sister Phyllis Weaver went to her Eternal Reward last night (Monday) around 9:00PM following a very brief illness. She was surrounded by her family and a number of Community members. S. Phyllis touched the lives and hearts of many through her years of ministry in education and hospitality. Posted on the wall of my room in the monastery’s guest wing. 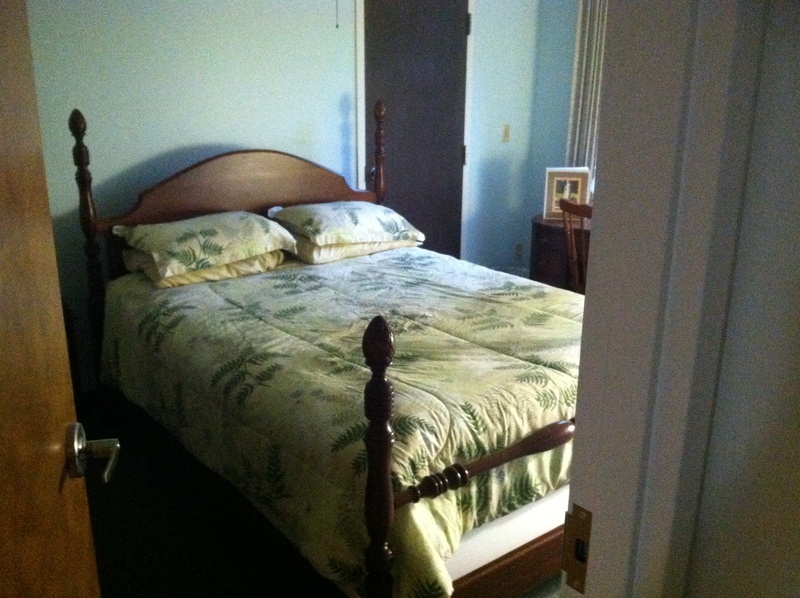 Until a few years ago, Phyllis was the sister I called to reserve a room or hermitage. When my daughter and son, now grown, were going through terrible times, I crawled to the Mount for sanity. The place was—and still is—life! Phyllis was at the center for me, greeting me when I arrived and checking on me unobtrusively when we saw each other after worship or lunch. Near the end of her call as Hospitality Coordinator, Phyllis’ shuffle gave way to an electric scooter—no padding left on the soles of her feet, she explained, just bone and skin. 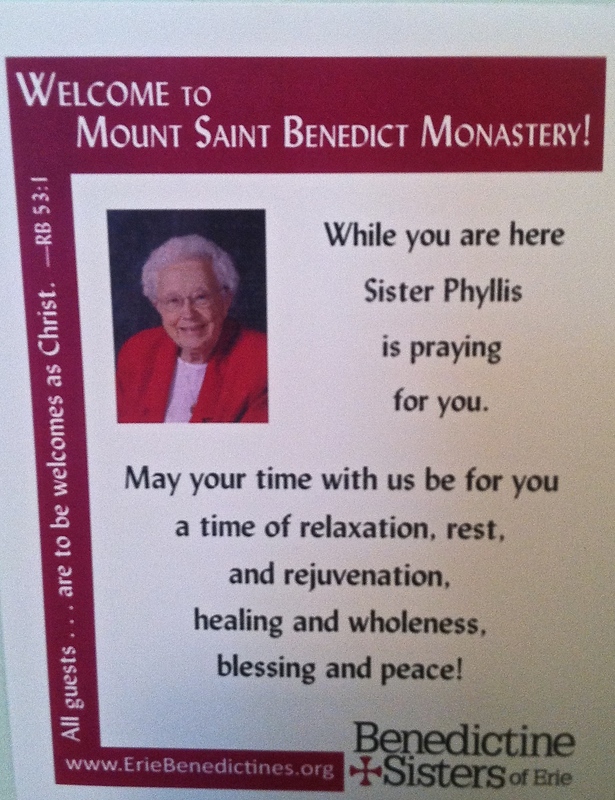 In retirement, Phyllis’ prayed for retreatants. I needed her petitions for their intention if nothing else and appreciated them as I rested like a crimson bruise in the light of the chapel’s stained-glass windows. 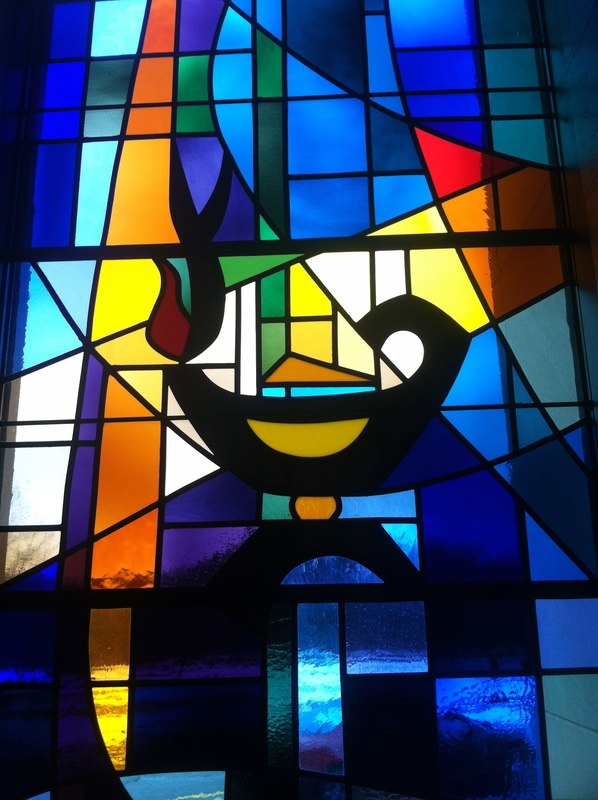 A lamp in the chapel at Mount Saint Benedict Monastery. If only I could be my own answer to this prayer. The best I can do some days is draw a meager smile from the deep well of mercy I’ve been granted. Still, Phyllis extended to me love based on the conviction that the Creator’s Spirit dwells within all people and nothing in daily life is more sacred than that moment when a person needs love in one of its countless forms and another person provides love gladly. “Let me recognize the Ultimate in you,” I say, “and may you find love in my eyes.” My namaste is ragged. If it gives warmth, it comes from a cold and broken hallelujah. I do trust the Divine Mystery to lead us to security eventually, but for now, I feel the cold of a world order in which being human doesn’t count for much. As massacres and fiascos make a disturbing media racket, people–individual dwellings for the Ultimate–lose life quietly, invisibly. Society’s eye evaluates humans, and, increasingly, we are expected to defend our personal cog on the rim of an imposing, impersonal wheel. I’m talking about progress. 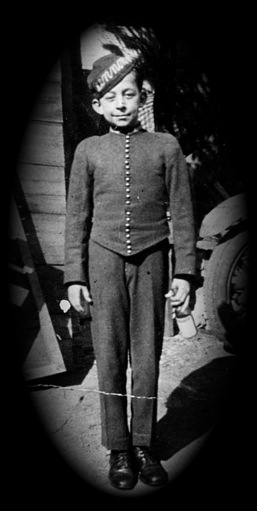 E. B. White first drew my attention to the crooked assumption that the best way to improve life is to nudge human beings out of the picture. In a 1955 New Yorker essay, White grumbled that the telephone company “saddled us with dials and deprived us of our beloved operators, who used to know where everybody was and just what to do about everything.” Good thing he passed in 1985, before call waiting and voice mail joined our cultural lexicon. E. B. 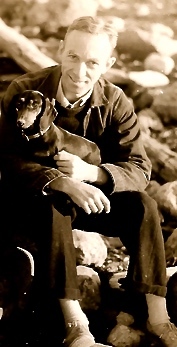 White holding his dachshund Minnie (Credit: Wikipedia). I don’t think there was a religious bone in White’s body, but he and Sister Phyllis probably would have hit it off. 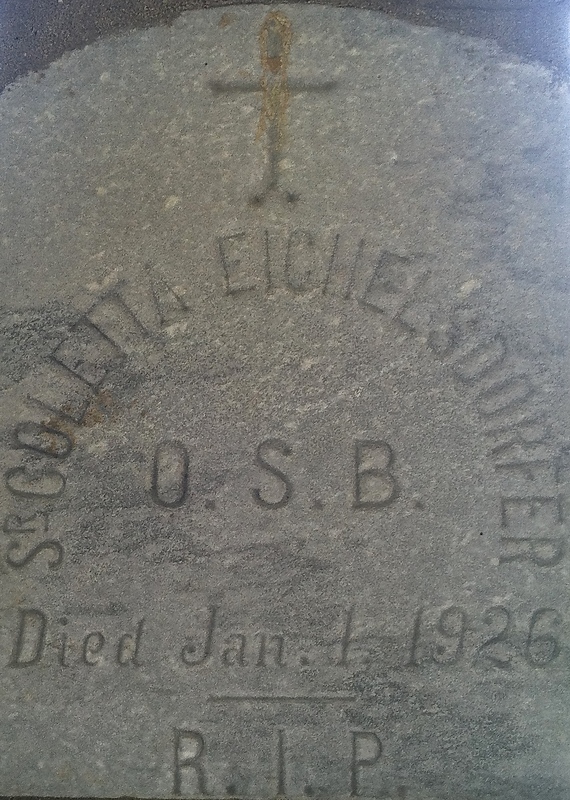 She was all about taking care of pilgrims, and he wrote, “All that I hope to say in books, all that I ever hope to say, is that I love the world.” You can’t read one paragraph of E. B. White without recognizing that his world was human beings and animals. He was against whatever threatened either one. In the last month I’ve heard stories that worry me. Andy, as White’s friends called him, would bristle. And I’m not sure, but Phyllis might have just shaken her head and returned to praying for retreatants. –A December 14, 2014, New York Times article by Claire Cain Miller opens with a troubling trinity: “A machine that administers sedatives recently began treating patients at a Seattle hospital. At a Silicon Valley hotel, a bellhop robot delivers items to people’s rooms. Last spring, a software algorithm wrote a breaking news article about an earthquake that The Los Angeles Times published.” If somebody is going to sedate me, I want to look ‘em in the eye. And some of my friends are print journalists, a profession already in decline. I’m not sure what an algorithm is, but it’s a scab compared to Jennie, Gerry, and Erica. –Also from Miller’s article: “Ad sales agents and pilots are two jobs that the Bureau of Labor Statistics projects will decline in number over the next decade. Flying a plane is largely automated today and will become more so.” As a jittery flyer, I don’t want my plane piloted entirely by computers. They fail without warning, constantly leave the backdoor unlocked, and refuse to accept reason. –NPR ran a story about computer chips being implanted in grape vines. This technology can take the guesswork—or artistry, depending on your point of view—out of watering and harvesting. When a commentator claimed that the chips’ grapes made better wine than the winemaker’s, I thought of poor Paul Bunyan being surpassed by a chainsaw. Cabernet Sauvignon at the Coleman dining room table: I would love to meet the winemaker. –A couple of weeks ago NPR’s Marketplace reported on the sale of PetSmart to a private-equity firm. Amidst the chatter somebody commented that Walmart-type stores cut into PetSmart’s business by carrying lots of pet supplies. At once my White-ian fears took hold. How long will it be before you can accommodate all of life’s needs at a single destination? Get your Airedale bathed and groomed while your SUV gets snow tires put on. Pick up General Tso’s chicken for supper. Have cataracts removed and touch base with your life coach. Yes, I’m being silly, but a voice in the ear of my heart warns me that herding every specialty under one roof managed by one entity could make transactions more uniform and less personal. 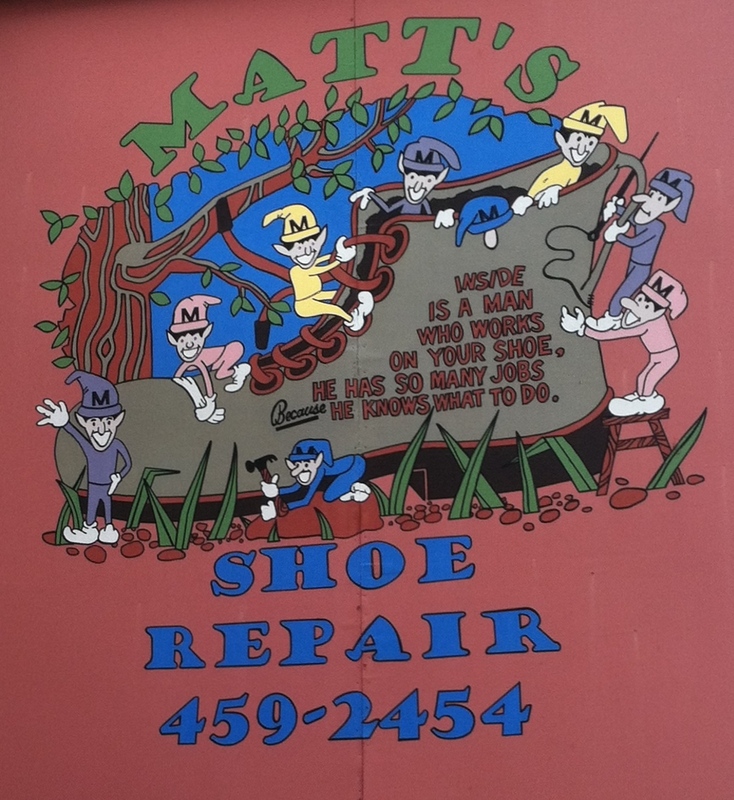 Maybe I’m wrong, but for fun I just Googled “shoe repair erie pennsylvania” and discovered that in my hometown proper, one shoe repair shop survives. 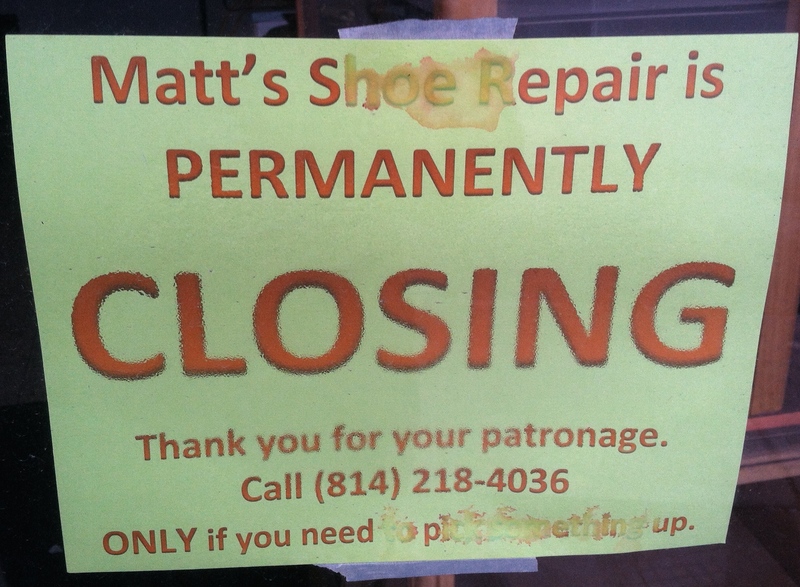 The idea to check came when I saw that Dom Bruno’s Shoe Repair in Little Italy had closed. 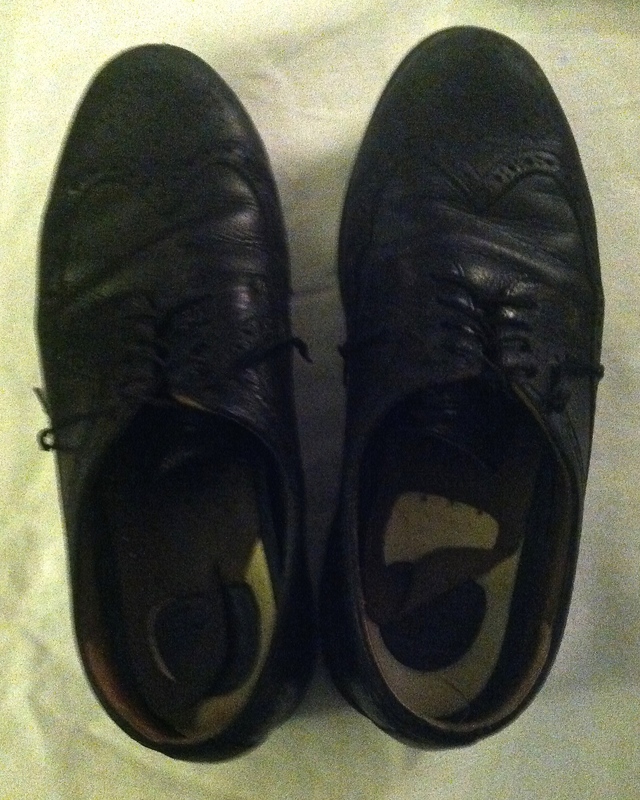 Ten years ago I took a pair of black wingtips to Dom, who resoled them for $45. Sounds like a lot, but those refreshed throwbacks remain my only pair of black dress shoes. “Where have all Dom Brunos gone, long time passing?” The thin, corner shoe repair shop that healed my wingtips. 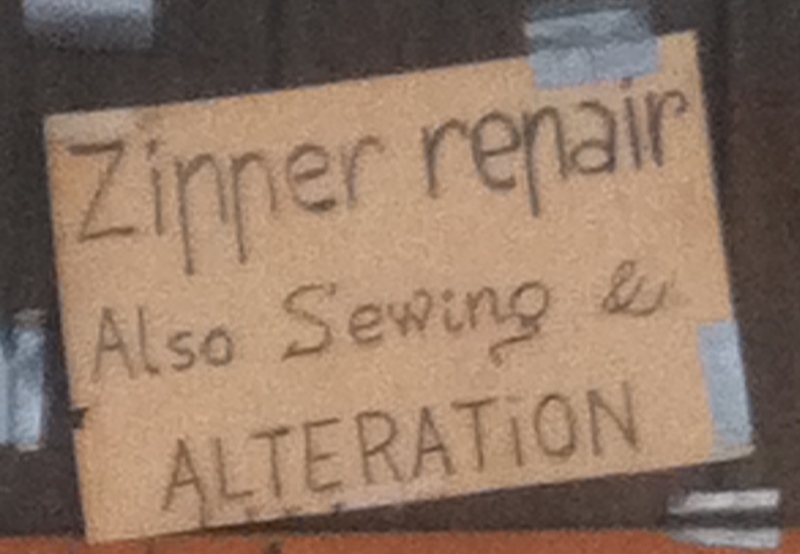 The only grainy evidence that Dom Bruno ever had a shop on Brown Avenue–a cardboard poster. According to Google, M. A. Krug and Son is now my only option, unless I want to drive fifteen miles west to Nick’s Shoe Repair in Girard. My wingtips need attention, and I wish for a redundancy of shoe repair shops in Erie, Pennsylvania–and at least one mom-and-pop corner store in every neighborhood. On the way to Sister Phyllis’ viewing, I made a sad discovery. 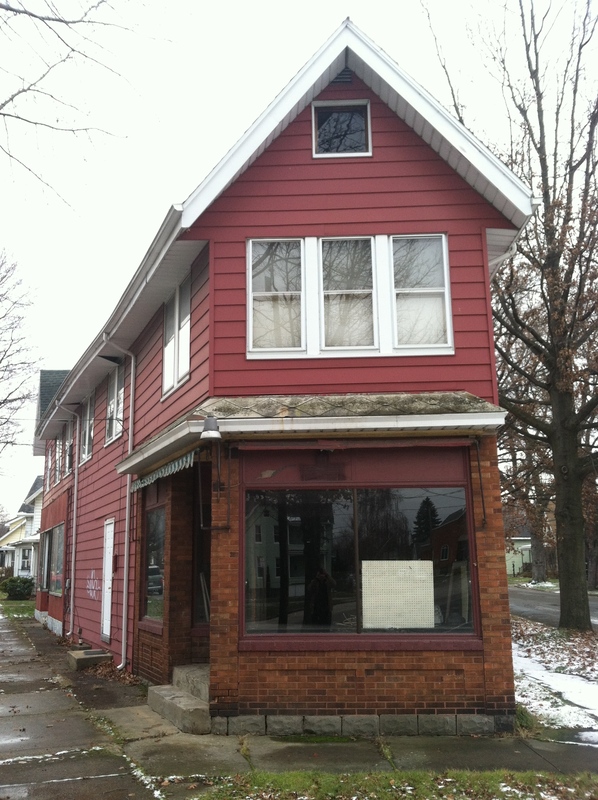 Unless somebody is tending shoes beneath an inconspicuous shingle, Erie, home of around 200,000 feet, is bereft of cobblers. Google is wrong. 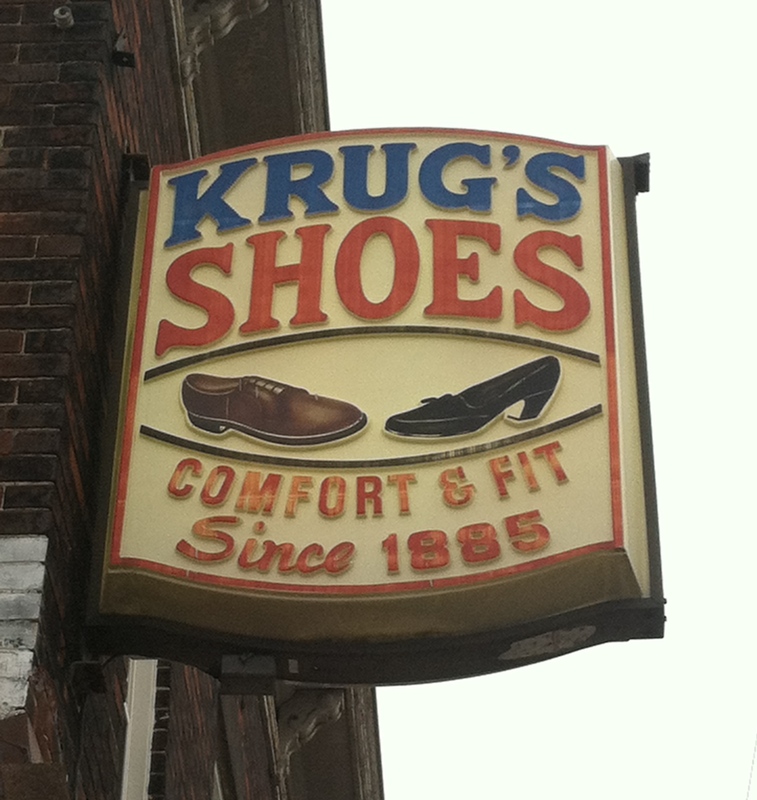 Mr. Krug no longer repairs shoes. 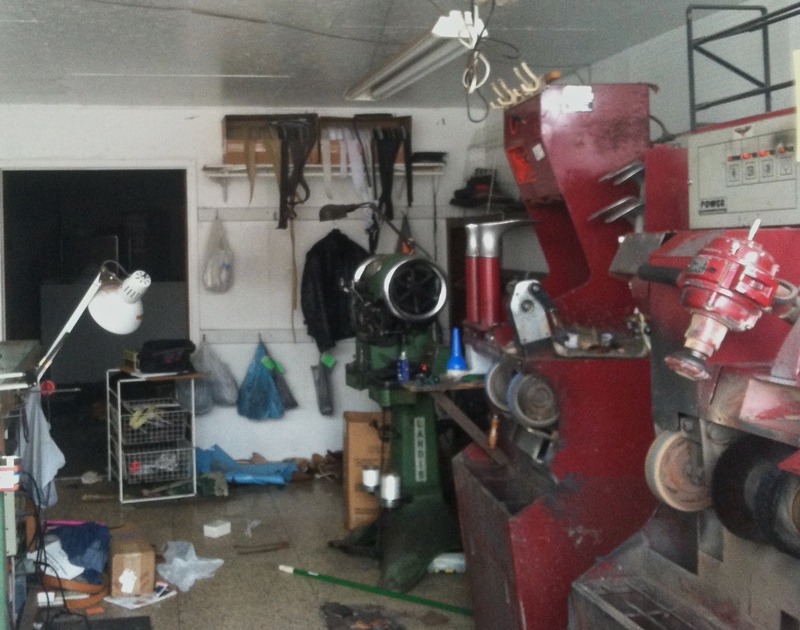 Stereo equipment, old albums, and silly signs now fill his shop. Posted by the entrance: Mr. Krug had a gruff sense of humor? Across Peach Street from Krug’s place, another dead shoe repair shop. Seriously? How long had the business been closed? Long enough for ink to run. Matt’s machinery sleeps behind dusty windows. Goodbye to a vocation. Actually, I’m not all that bugged about my wingtips being S.O.L. I’ll get a new pair. The trouble is, I’ve lost track of Dom Bruno, and it might have been nice to meet Mr. Krug and ask which kin started the shop in 1895. And anybody who makes a sign like Matt’s is bound to be good for a laugh or two. Bottom line: the world’s best hope for health and gladness isn’t the robot, but the bellhop. There’s no way the former can look into a stranger’s eyes and recognize that a special word of kindness is needed. The latter not only carries luggage, but can also lighten a burden. I might not be able to tell which wine was made by person or machine or which news story was written by an algorithm or a friend, but none of that matters. I want to be a Sister Phyllis receiving flawed, unpredictable, expensive human guests into the safety of my presence. I want to be an Andy White, betting my money and heart on women and men creating and mending the world over and over, messing up and starting again. When I reached the Mount and looked down at Phyllis, I was sobered. She didn’t look herself at all. Her face was oddly tanned, her hair flattened. But I’ve seen enough dear ones in coffins to give an interior shrug. Before long Prioress Anne Wambach said hello and took my hand. At once I understood that my reason for paying respects to Phyllis wasn’t to honor the dead, but to receive life. Our conversation took less than a minute. I don’t remember what I said, but the idea was that Phyllis made me feel welcome. Clearly, Anne had heard this dozens of times already. She told me that Phyllis had done well until the end: a couple of falls, morphine, and confusion. Death came within a week. No Benedictine is forgotten. Every single sister matters. Phyllis hadn’t suffered long; this gave me comfort. Anne took my hand and looked into my eyes; this gave me not only comfort, but a truth to live by. No software can estimate the value of a handshake or predict what healing and wisdom can result when two persons look into each others’ eyes. Thanks, Anne. Thanks, Phyllis and Andy. I have my personal orders within the world order. I’m bound to mess it up, but I’ll try: take strangers by the hand, John, and see the Great Mystery in their eyes. John: Please accept my sympathies for your loss of a friend; and thank you sincerely for a special piece. I loved it. I love what you write John. This one is no exception. Special. Happy New Year to you and your family. This piece was so evocative – my heart is full. Thank you. Hmmm, I was just thinking about my intention for 2015 and it includes looking people in the eye. Peace.